Saudi Arabia may be the country in the world most different from the United States, especially where religion is concerned. An important new bill introduced by Rep. Dave Brat (R-Va.) aims to take a step toward fixing a monumental imbalance. Anyone can build a religious structure of whatever nature in the United States, so the Saudis fund mosque after mosque. In the kingdom, though, only mosques are allowed; it hosts not a single church – or, for that matter, synagogue, or Hindu, Sikh, Jain, or Baha'i temple. Hints going back nearly a decade that the Saudis will allow a church have not born fruit but seem to serve as delaying tactics. Pray any way you wish in America, so long as you do not break the law. Non-Muslims who pray with others in Saudi Arabia engage in an illicit activity that could get them busted, as though they had participated in a drug party. The United States, obviously, has no sacred cities open only to members of a specific faith. KSA has two of them, Mecca and Medina; trespassers who are caught will meet with what the Saudi authorities delicately call "severe punishment." 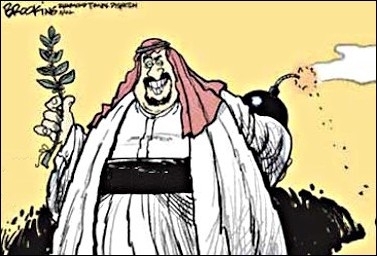 The Saudis have spent an estimated $100 billion spreading Wahhabi Islamism abroad. With only rare (and probably illegal) exceptions, the U.S. government does not fund religious institutions abroad (and those exceptions tend to be for Islamic institutions). In contrast, the Saudi monarchy has spent globally an estimated US $100 billion to spread its Wahhabi version of Islam. Products of Saudi-funded Wahhabi schools and mosques have often been incited to political violence against non-Muslims. The Saudis have been arrogantly indiscreet about spending to promote Wahhabism. 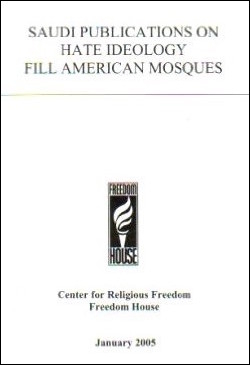 For example, a 2005 Freedom House report reviewed some of the extremist literature provided to the public by Saudi-funded institutions and concluded that it poses "a grave threat to non-Muslims and to the Muslim community itself." The monarchy has also given multiple and generous grants to the Council on American-Islamic Relations, the most aggressive and effective Islamist organization in the United States. Freedom House blew the lid off of Saudi funding of extremism in 2005. This discrepancy, a version of which exists in every Western country, demands a solution. Some Western governments have taken ad hoc, provisional steps to address it. • In 2007, the Australian government turned down a Saudi request to send funds to the Islamic Society of South Australia to help build a new mosque. "Obviously we don't want to see any extremist organisation penetrate into Australia," explained then-Foreign Minister Alexander Downer. Eight years later, Saudi diplomatic cables released by WikiLeaks affirmed the kingdom's intense interest in influencing Islamic politics in Australia. • In 2008, the Saudis offered to finance construction of a mosque and Islamic cultural center in Moscow, prompting three Russian Orthodox groups to write an open letter to then-King Abdullah suggesting that his kingdom lift its ban on churches. • In 2010, Norway's Foreign Minister Jonas Gahr Støre turned down Saudi funding for a mosque on the grounds that the Saudi kingdom lacks religious freedom. • In July, reeling from multiple attacks over 18 months that killed 236 people on French soil, Prime Minister Manuel Valls mused about prohibiting foreign funding of mosques "for a period of time to be determined," provoking an intense debate. These one-off responses may satisfy voters but they had almost no impact. That requires something more systematic – legislation. Brat's proposed bill, H.R. 5824, the "Religious Freedom International Reciprocity Enhancement Act," makes it unlawful for "foreign nationals of a country that limits the free exercise of religion in that country to make any expenditure in the United States to promote a religion in the United States, and for other purposes." Hello, Saudi Arabia! Americans cannot allow Riyadh to smother the secularist principles basic to Western life. To "promote a religion" includes funding "religious services, religious education, evangelical outreach, and publication and dissemination of religious literature." Should funding proceed anyway in defiance of this bill, the U.S. government can seize the monies. The bill needs more work: it omits mention of religious buildings, offers no criteria for seizure of property, and does not indicate who would do the seizing. But it offers an important beginning. I commend it and urge its urgent consideration and adoption. Americans cannot abide aggressive unilateral actions by Riyadh (or, for that matter, Tehran and Doha) exploiting their oil bonanza to smother the secularist principles basic to Western life. We must protect ourselves.